Valves are highly arched. The dorsal margin has a constant 4 bluntly pointed undulations. Terminal undulations are distinct from and don't coalesce into the apices. The ventral margin is concave and follows the same curvature as the dorsal margin. The apices are wider than the undulations and obtusely rounded. Distal raphe ends lie along the valve face very close and parallel to each end. Striae are radiate throughout and of two types: complete striae that extend the full width of the valve and short striae that occur only along the dorsal margin. 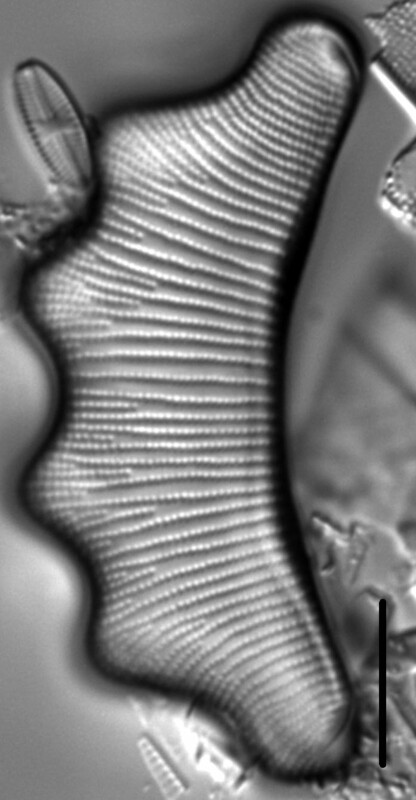 Short striae are more numerous in the undulations where they fill the gaps between complete striae. A fine transparent line runs close and parallel to the ventral margin. Striae on either side of this line may be continuous or displaced. 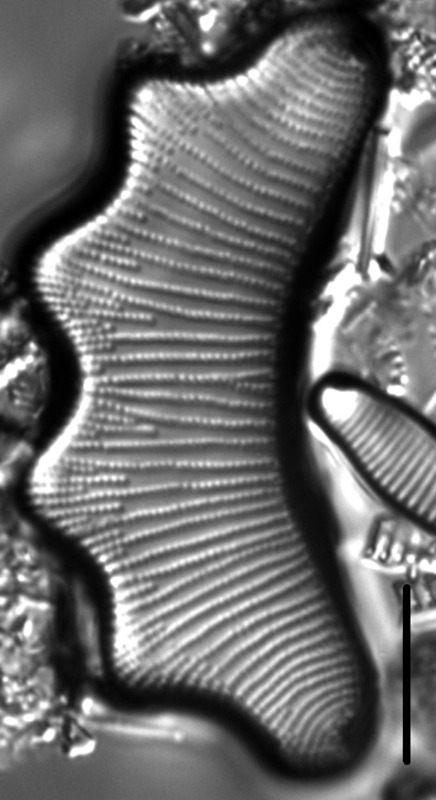 Areolae in the striae are easily resolved in LM and number 20-25 in 10 µm. Two morphotypes are present in the United States: The morphotype illustrated here (Morphotype I) and one in which the two central undulations are broadly rounded and the two outer undulations are acutely rounded (Morphotype II; see plate 10, figs. 6-10 in Werum & Lange-Bertalot 2004 and plate 105, figs. 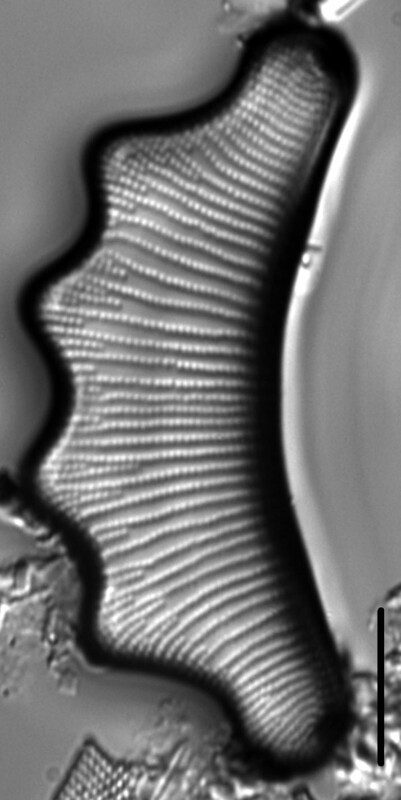 5-9 in Lange-Bertalot et al. 2011). 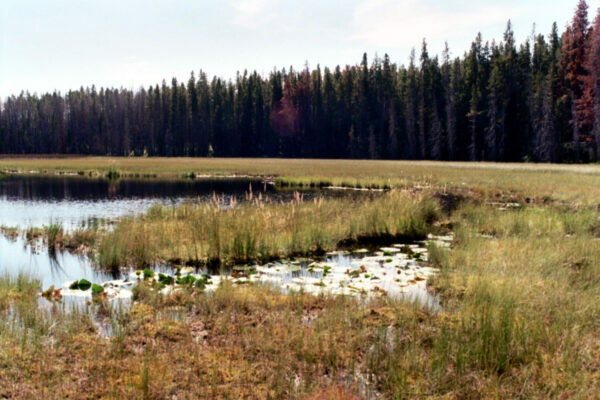 Eunotia tetraodon has been collected from several ponds and small lakes in the Northern Rockies, where it is associated with aquatic vegetation. These waters all have low electrical conductance (range 19-31 µS/cm) and circumneutral to somewhat alkaline pH (range 5.50-8.81). Lange-Bertalot et al. (2011) report E. tetraodon as an infrequent component of the Holarctic flora in boreal and alpine regions of North America and Eurasia. Ehrenberg, C.G. (1838) Die Infusionsthierchen als vollkommene Organismen. Ein Blick in das tiefere organische Leben de Natur erlag von Leopold Voss, Leipzig. pp. 1-xvii, 1-548, pls. 1-64. Patrick, R.M. (1958) Some nomenclatural problems and a new species and a new variety in the genus Eunotia (Bacillariophyceae) Notulae Naturae 312: 1-15. 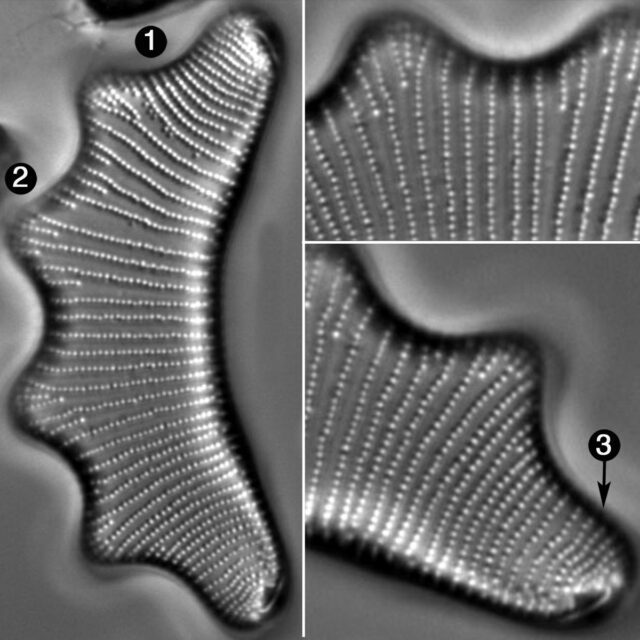 Eunotia tetraodon has large valves with highly arched dorsal and ventral margins. The dorsal margin has a constant 4 undulations. Apices are broad and obtusely rounded.